Kyle Busch won the pole for Saturday’s Monster Energy NASCAR Cup Series race during an weather-abbreviated qualifying session on Friday at Kentucky Speedway. Busch laid down a record-breaking fast lap in 28.379 seconds (190.282 mph) at the newly repaved 1.5-mile. The laps came in a session was cut from three rounds down to two because of lightening in the area. The Joe Gibbs Racing driver’s lap was .013 seconds faster than that of Martin Truex Jr, who will start second for the fifth time in 18 races this season. The pole was Busch’s third of the season, his second in seven tries at Kentucky and the 22nd of his career. “The guys have done an amazing job this year at building faster race cars as we’ve gone on this year,” said Busch, who also won the pole for the NASCAR XFINITY Series race, which was postponed from Friday until noon Saturday because of the same storm. Matt Kenseth, the 2013 Kentucky winner, was third fastest in the decisive second round, followed by Jamie McMurray and Denny Hamlin, as Joe Gibbs Racing – winless through the first 17 races – garnered three of the top five starting spots. With Truex second on the grid, Toyotas hold four of the top five positions. Ryan Blaney, Kevin Harvick, Jimmie Johnson, Daniel Suarez and three-time Kentucky winner Brad Keselowski will take the green flag from positions six through 10, respectively. Series leader Kyle Larson, who was fastest in qualifying trim during final practice, will start 40th, after his No. 42 Chip Ganassi Racing Chevrolet failed to clear pre-qualifying inspection in time to run a lap in the first round. “We will be fine from the back,” Larson said. 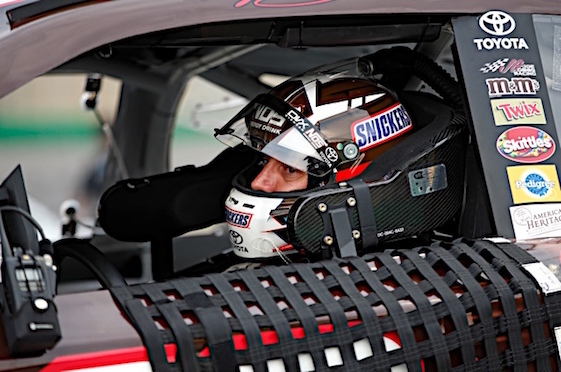 “Our Target Chevy was really good today, I thought, in race trim – better than I’ve ever felt at Kentucky. (18) Kyle Busch, Toyota, 190.282 mph. (78) Martin Truex Jr., Toyota, 190.194 mph. (20) Matt Kenseth, Toyota, 189.740 mph. (1) Jamie McMurray, Chevrolet, 189.713 mph. (11) Denny Hamlin, Toyota, 189.687 mph. (21) Ryan Blaney, Ford, 189.560 mph. (4) Kevin Harvick, Ford, 189.553 mph. (48) Jimmie Johnson, Chevrolet, 189.321 mph. (19) Daniel Suarez #, Toyota, 189.288 mph. (2) Brad Keselowski, Ford, 189.215 mph. (22) Joey Logano, Ford, 189.109 mph. (24) Chase Elliott, Chevrolet, 188.844 mph. (88) Dale Earnhardt Jr., Chevrolet, 188.772 mph. (77) Erik Jones #, Toyota, 188.752 mph. (41) Kurt Busch, Ford, 188.686 mph. (14) Clint Bowyer, Ford, 188.587 mph. (43) Darrell Wallace Jr.(i), Ford, 188.442 mph. (17) Ricky Stenhouse Jr., Ford, 188.311 mph. (6) Trevor Bayne, Ford, 188.311 mph. (10) Danica Patrick, Ford, 187.520 mph. (95) Michael McDowell, Chevrolet, 186.265 mph. (37) Chris Buescher, Chevrolet, 186.194 mph. (5) Kasey Kahne, Chevrolet, 186.123 mph. (27) Paul Menard, Chevrolet, 185.899 mph. (3) Austin Dillon, Chevrolet, 185.561 mph. (38) David Ragan, Ford, 185.382 mph. (13) Ty Dillon #, Chevrolet, 184.799 mph. (47) AJ Allmendinger, Chevrolet, 184.754 mph. (31) Ryan Newman, Chevrolet, 184.634 mph. (32) Matt DiBenedetto, Ford, 183.880 mph. (83) Ryan Sieg(i), Toyota, 181.647 mph. (72) Cole Whitt, Chevrolet, 181.269 mph. (15) Reed Sorenson, Chevrolet, 180.475 mph. (23) Joey Gase(i), Toyota, 179.623 mph. (34) Landon Cassill, Ford, 178.849 mph. (33) Jeffrey Earnhardt, Chevrolet, 177.995 mph. (51) BJ McLeod(i), Chevrolet, 177.107 mph. (66) Timmy Hill(i), Chevrolet, 176.794 mph. (55) Gray Gaulding #, Toyota, 176.453 mph. (42) Kyle Larson, Chevrolet, 0.000 mph.